The colors are beautiful on these heavy fabric drapes. They look great in our mid-century style decor and do block a fair amount of light. 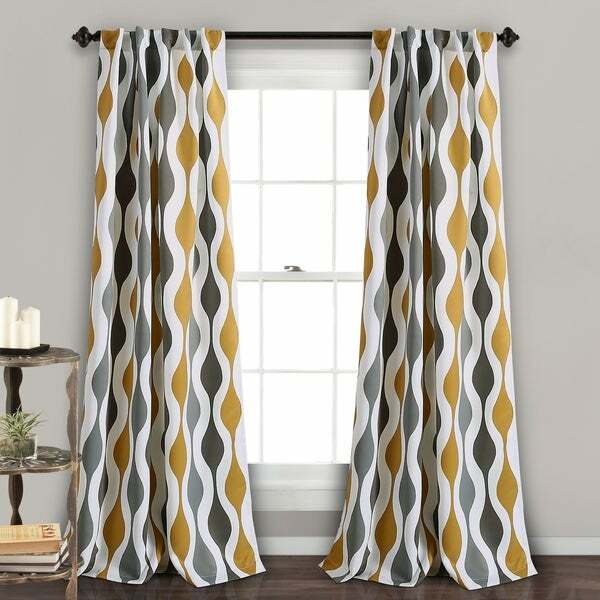 This set of curtains is so unique and stylish. The colors appear to be like liquid paint dripping down the panels from top to bottom. This is definitely a statement piece for your home. The pattern is printed on light blocking fabric. Sold by the pair. Machine Wash Cold, Mesh Bag, Similar Colors, Gentle Cycle. Use Only Non-Chlorine Bleach When Needed Tumble Dry Low, Light Iron If Needed. Very high quality curtain panels, with gorgeous color. I plan on using them to cover over where old-fashioned sliding doors were used to hide my washing machine and dryer. With the right curtain rod, these panels will provide a more modern look for not a lot of money. They are truly room darkening (can't see through them at all). Great purchase. I framed my room to compliment the curtain panels. Rich satin material. The main attraction in the room. Quality and beautiful to the eye. I love the fabric and heaviness, they light up the room perfectly in the day time and darkens the room and night. They go perfectly with my new furniture in the Master Suite! I will definitely by another pair in a different color. These curtains are fabulous! The fabric, which I believe is polyester, is a medium weight and is very luxurious. Not what I would have expected for the low price. I purchased the turquoise/orange and the colors are beautiful and just as pictured. Beautiful, stylish curtains that came in a timely manner. I love the design and the fact that you can get a matching shower curtain. Would definitely recommend. I just love the blend of colors. I recently painted an accent wall dark gray. I have black Venetian blinds. So the gold adds a bit of color to the bedroom as I have white sheets. The quality is great. Highly recommended. Really sharp looking! The colors are true to the picture so I am really happy. Very well made. I get lots of compliments on these. If you like a little something different than the usual, try these! I may even get more for an adjoining room. Beautiful window treatment made of high quality material. They have become the focal point of the room. Color was also fade into a dirty mustard color almost like they were used. THESE ARE GREAT IN THE BACK BEDROOM. I HAVE WAITED TO GET THE HOUSE A MAKE OVER AND JUST NOW PUTTING THINGS IN ORDER AFTER WORKERS GET FINISHED. I'M GOING TO BE WELL PLEASED WITH THE FINAL LOOK, I KEEP LOOKING AT THEM EACH DAY. Doesn't darken the room as much as I was expecting, but I do like the way the colors pop. "What are the colors on these curtains - is it yellow or gold? What other colors please"
The yellow is more of a mustard color. The curtains also include dark grey, light grey and white.